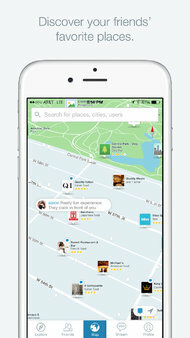 Citymaps is a free mobile app that allows users to create social and personalized maps. Citymaps was “founded on the belief that maps should be more than just tools of navigation” (http://about.citymaps.com/), and enables users to create a personalized collection of their favorite places that they can take with them wherever they go and share with their friends. The app stores information from over 80 million different businesses around the world, and users can pinpoint their favorite places, find information on deals, and see whether their friends have reviewed places. Specialized maps can then be created that feature everything from hot travel spots, to the best coffee roasters, civil war locations, and places to stop on road trips. Each personalized map grows as the user continues to add new favorites and collaborates with other users. The app was listed as a “Best New App” by the iTunes App Store, and is available on both IOS and Android devices.